Last weekend I had the great, giggle-filled pleasure of watching Bimal Roy's Prem Patra with Gebruss, PPCC, and Kaddele. "Chat cinema" proved to be much more interesting than the movie to me most of the time, so my comments about this movie are sparse and not entirely well-informed. 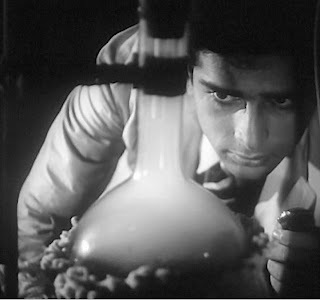 Shashi Kapoor plays upstanding, fellowship-winning medical student Arun, who falls for fellow student Kavita (Sadhana Shivdasani). (Yessss! Girls do science!) However, Arun is the unrequited object of affection for Ratna (Parveen Choudhary). Ratna is a petulant little brat, and in a moment of stupid spite she forges a love letter from Arun to Kavita. Kavita is furious - huh? is this a flip on the usual filmi "it's not stalking, it's love!" turning a love letter into harassment? - and turns Arun in to the school authorities, who promptly expel him and take away his fellowship. PROBLEM #1: when asked by the principal if he wrote this letter, Arun says "yes," even though he did not and he knows who actually did. What?!? Everything else that happens in this movie is pinned on this stupid, self-damaging lie. Gebruss pointed out that perhaps he does it to protect Ratna (who is a family friend), but still, surely there could have been another way out of this situation (like getting Ratna's father to broker a deal with the school principal). But because of the need for doctors in his rural hometown (excellent commentary on actual issues! ), the local landlord decides to cover Arun's fellowhip expenses, enabling him to go abroad for further study as planned - with the catch that Arun will marry his daughter, Tara (Seema Deo). But Tara, of course, likes somebody else, the smug modern/western Subhash (Sudhir). And equally "of course," Tara and Kavita turn out to be related and end up moving in together (I forget who goes to whose house). Tara feels compelled to write Arun a letter or two even though her heart isn't in it, but Kavita offers to do it for her. I honestly don't remember whether Kavita realizes who Arun is at this point - I don't think she does. Given the title of the film, you can imagine what happens as "Tara" and Arun's correspondence continues...and how crappy Kavita feels when Arun reveals to "Tara" how much hatred he harbors for the girl from his past. PROBLEM #2: does Kavita come clean at this point? What do you think? Bad stuff continues to happen and Kavita's deception builds proportionally to affection for Arun and her investment in the correspondence. And then some wonderfulness happens and everyone is happy and the movie ends - the whole cast stands around chuckling in the final frames, quite literally coming together and reminding us that all is well. Oh, and Rajendra Nath is the annoying comic sidekick and is almost (and deservedly) eaten by a tiger. Unlike Chupke Chupke, whose shenanigans ended just before I started to lose patience for them, Prem Patra continues too long for my liking, and the ending was completely predictable yet, for me, not satisfying, I think because it cleaned up messes caused by contortions I couldn't get behind. The story made me say "Really?" a lot, not in the "Wow, I can't believe this wonderful thing is happening!" way but in the "Is this actually what the movie is going to do now? Seriously?" way, which I should refer to as "Kingdom-of-the-Crystal-Skull Really," since that was my dominant reaction to that movie. Anyway. The major obstactles for the characters to overcome are poorly founded. The movie indulges too much and for too long in deception for no good reason, and I just couldn't get past the characters' unreasonable, unnecessary decisions and the clunky, symbolic tragedies that befell Arun. It's not without its charms, though. I love stories about people falling in love through letters - they feel so very Jane Austen. 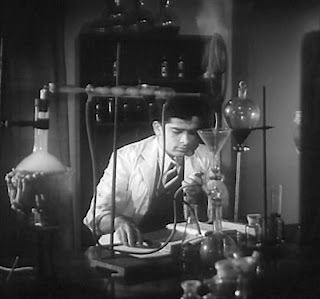 I also love stories in which book-smart, brainy people are romantic leads, and in that vein I couldn't be more pleased to see Shashi in a lab coat. Actually, yes I could: he could be an archaeologist or language student (something more in the humanities than the scienes), sitting in a library wearing a tweed coat with elbow patches, but I digress. À la Clueless, there's a makeover scene, with Tara transforming from country bumpkin to slick, eye-catching modern girl. (I feel so conflicted about makeover scenes: I always like them, squealing "Oooh, project!" and clapping my hands just like Alicia Silverstone, even though the very concept of "fixing" someone is disrespectful and rude and overly emphasizes physical beauty.) I agree with Old Is Gold, who liked Prem Patra a lot more than I did, that many of the scenes are very pretty to look at (especially when characters gaze out of windows or stare off into the distance over balconies) and that the acting is solid. Sadhana as Kavita is especially good, and she made me believe that Kavita thought pretending to be Tara was a good idea, even though I didn't agree with her. Shashi as Arun is typically classy and endearing at the beginning, and you can understand why Ratna can't get over her crush. However, once Arun returns to India after his fellowship and tragedy and meets "Tara" in person, he gets increasingly worked up about the wrongs Kavita inflicted on him in the past. I'm not sure if Shashi overdid Arun's distress, cranking it from sadness into aggressive bitterness, or if the character as written demanded such anger. Maybe I'm being too hard on Arun - it's hard to be objective about yourself when your emotions are heightened by love and disappointment. Prem Patra will probably find its way into my DVD player again, if just for the songs and to see Arun fall for Kavita before Ratna pulls her prank. I'm also interested to learn more about Bimal Roy - this was my first of his movies - but please recommend something other than Devdas because I'm not sure I can take it. No doubt I missed some fine touches in Prem Patra while I was busy typing to and laughing with my viewing companions, although the International Relations Ministry of Shashi Pradesh was very pleased with the quadrilateral turnout. Everyone else will be writing up their impressions, right? Right? And doing the screen-capturing and noting of plum details that I was too uninspired to do? I thought so. I liked Prem Patra...but in a lukewarm kind of way. Madhumati and Sujata are Bimal Roy films that I enjoyed more. Do Bigha Zameen is good too although verrrrry seeerrrrrious. I can answer one question: Kavita know who Arun is when she writes Taras letters for her. When Tara and her father first come to see Kavita and her family she has a dramatic "clinging to the barristers" moment when Tara's fiance is first mentioned. Also, I was more forgiving towards Arun after the tragedy. He is under a lot of stress and may not be thinking entirely cleary. I adore Bimal Roy's movies - Bandini is my all time fave Hindi movie which you absolutely have to watch! Parakh, Sujata, Madhumati were all staples of my childhood. My mom's fave movies are the last two and she can sing songs from them all day. Parineeta is pretty good too. Do Bigha Zamin is powerful but watch it with a hankie or two and a bottle of bourbon. Depressing! Otoh, it's Balraj Sahni at his soulful best and that is not to be sneered at. I completely agree, Beth and Memsaab: my reaction to this film was very "meh". While I like a good melodrama complete with tragic lab accidents, I just couldn't really buy into the whole thing. Ratna was too annoying. The romance between Arun and Kavita never got past simmer. And the songs elicited a shrug. So uninspired was I that this went into the "not going to be reviewed" pile, though I'm feeling a bit guilty about that now. Such uniform condemnation of my favorite movie! :-( Guess its target audience didnt much buy into it either, since it was a box-office failure. I think Bimal Roy's genius lay not in always choosing great stories but presenting (sometimes) absurd stories in a more artistic fashion. His movies usually involved all the standard masala ingredients except for over-the-top histrionics and Prem Patra is a good case in point. He treaded a sort of middle-path between commercial and art-house cinema years before the latter was formally born. Indiequill and Memsaab have suggested some of his most popular and enduring works but I like his lesser known movies just as much and one of my favorites is Benazir. Its the kind of run-of-the-mill sad-courtesan drama that I usually detest but with Bimal Roy's direction it is pretty watchable. Have reviewed Parineeta and Parakh, as well - both of which I loved. memsaab - Yeah, "lukewarm" gets at it. gebruss - Oh that's right! How did I forget the clinging? indiequill - I love bourbon! Sign me up. PPCC - See, I was totally confused, because I thought you were in luuuurve with it! CHat cinema is v hard to keep track of, apparently. Anyway, don't feel guilty - life's too short! I say that, after watching part of an SRK song DVD this morning and feeling like I should watch Devdas again even though I didn't like it the first time. Bollyviewer - Was it?? Interesting! Great point about PP's masala-ish-ness. Reviewer - Thanks! Glad you stopped by! I love how you gave me a clear picture of the film despite the fact that you were not too thrilled with it--Thank you for writing for us, anyways! Love how you say this film will make its way back into your DVD player despite your initial reaction. Funny how it is with Hindi films, hey? I don't know about you, but if I don't like a Hollywood film, I probably won't revisit it. But I've watched "Salaam-E-Ishq" about four times, and I don't think I even liked it all on the first spin! (Speaking of which, maybe, just maybe you should try "Devdas" again--One of my very first Hindi films, I disliked it initially and both understood and enjoyed it a whole lot better in subsequent viewings). I really liked this movie, despite the inexplicable choices and extreme overreactions everyone was guilty of. It's the one that made me a Shashi fan. Hi Cindy - As long as one comes around to Shashiness, all is well! The turning point for me was Do aur Do Paanch.